Use PayPal or Cards to process the payment. Checkout as a PayPal Guest with a credit card OR Checkout with your PayPal Account. 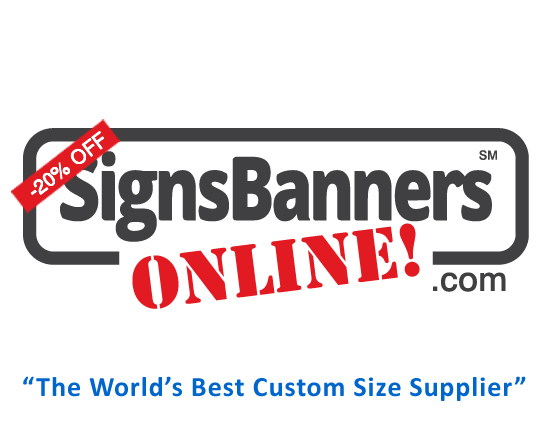 * SignsBannersOnline do store or retrieve any payment details. Payments are held in a neutral fund until you release them. You can order now, receive your goods and finalize the payment release to the factory later. Your payment is held in protection before being released from a neutral bank account. We hold the funds in a neutral bank account for up-to-10 days after the order has been sent. You can release payment to the factory anytime OR this will occur automatically 10 days past order being sent. Funds are held in a neutral account for up-to 10 days. You can also Finalize payment anytime within 10 days to complete the action. All PayPal buyer protection policies STILL APPLY giving you peace of mind. Payment gateways are encrypted by PayPal security features. You can use all features of PayPal account and/or card services such as Visa / MasterCard plus+ more. You can pay in your preferred currency. After completing your name details, uploading, viewing your Instant Preview and payment via the PayPal gateway you will be automatically redirected back to a special 'MyPage' on SignsBannersOnline.com where you can watch all stages of your order as it moves around the factory and to your door. Your paid funds will be held in a neutral account for up-to ten (10) days for you to Finalize the order and release payment to the factory. Inadequate scheduling or shipping time is not reason for dispute. You have access to self manage all features of your pre-, during- and post-order. We understand that your order may be deadline driven and we appreciate this element of our industry, however, shipping times are not guaranteed. Please allow sufficient time to ship out to your destination. Within a few steps you can manage all your wholesale orders and track all features. This is your shipping label and printable receipt. Details are used for shipping purposes only. Upload your banner print ready file for each line item. An Instant Preview will appear matched to each line item. SBO is an automated Web2Print process. If you are a customer buying for the first time wholesale or need setup assistance please send your files via Let Us Design. Next to each Instant Preview is an approve button. Approve, remove or re-upload. Pay the full amount via PayPal using credit cards, company account or login. Funds are processed and held in a neutral bank account. After completing PayPal payment you will be automatically redirected back to your special 'MyPage' on SignsBannersOnline.com where you can track all aspects of your order. Finalize the order and release payment to the factory when your goods arrive.